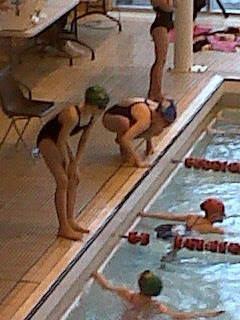 Madeleine swims four races: one butterfly plus three crawls including two anchors on the medley and freestyle relays. Since this is London, one-lap a weird 33-meters which makes it impossible for me to judge, by times, whether the kids are fast when compared to when I was an age-lapper. Regardless, Madeleine crushes it : she wins her individual crawl in a time of 25.84 (the judge says fastest time for Year-5s, boys and girls) and powers through the relays delivering top place for both. The look of joy, pure joy, on her face like nothing else. I have not seen it before or, if I have, it was when we got the dog. And there that smile is again made all the better as Madeleine shares her happiness with her team-mates. Eitan cruises to victory in his 33-meter freestyle (21.83), backstroke and two relays. He is polite , even shy, after each race : he looks at me briefly for encouragement, offers a sheepish grin, then off to the accolades of his friends. It amazes me how the parents yell at their darling athletes: "Gooo!! 'Beck!" (the Dad behind me emotes) "Go. Go! GOO!! Argghh! Don't Quit. Agg!! YOU ! ARE ! ALMOST THERE 'BECCAAAAA!! ! The noise deafening and shrill made worse by being indoors. The football pitch, where I expect nastiness on occasion, no comparison to this. And mostly the mums, too, who, when I see them at the school yard, are the most civil people I know. So reserved, so British. And now it is all, like,"FASTER! F-A-A-SSSTT-E-R-R!!" SM wins the gala and everybody feeling good. Pizza for dinner. Woo hoo! Any kid knows that to see one's future, look at the parents. It has been non-stop since returning to London Saturday. So I roll with it : Parents swimming dinner-party; Jeremy Ben-Ami reception; Sunday brunch with the neighborhood and Rusty. Oh, and I meet the Asst Treasurer of Diageo, the largest drinks company in the world. Ben-Ami is interesting. His family connection to Israel goes back 130 years to the first aliyah when his great-grandparents were among the first settlers in Petah Tikva. His grandparents were one of the founding families of Tel Aviv, and his father was an activist and leader in the Irgun, working for Israel’s independence and on the rescue of European Jews before and during World War II. Ben-Ami served as the Deputy Domestic Policy Advisor in the White House to President Bill Clinton in the late-90s and has worked on seven Presidential and numerous state and local campaigns. He was Howard Dean’s National Policy Director in 2004 and helped manage a Mayoral campaign in New York City in 2001. The Jerusalem Post recognised him as one of the world's top-50 influential Jews. In 2008, he founded non-profit PAC J Street, which argues "a two-state solution to the Israeli-Palestinian conflict is essential to Israel’s survival as the national home of the Jewish people and as a vibrant democracy." Tonight he debates Israel and the US in the Middle East at Cadogan Hall, moderated by Roger Cohen of the New York Times.